Family traditions are something that you’ll always remember. As we all grow older, it’s common to remember those traditions and yearn to create your own family traditions with your family. This morning I had a memory of a tradition that my mother began in our family when I was a small child. 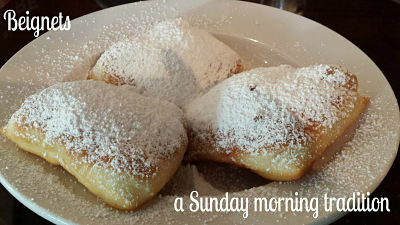 On Sunday mornings when we’d skip church, she’d fire up the deep fryer and roll out some beignet dough and we’d fry up a batch of beignets. Our job was to shake them in a paper bag filled with powdered sugar. On the mornings when we did go to church, we’d head to Meche’s for a donut run after mass. Dinner on Sunday evening was always the same – my mom baked cornbread in a black cast iron skillet and the warm cornbread was served in a bowl filled with milk – similar to a hot cereal. The kids would usually pile sugar into their serving, but my parents opted for some fig preserves that my grandmother would put up each year using figs from her tree in her back yard. Both of my parents LOVED my grandmother’s fig preserves. Like most Cajun families, we had rice & gravy almost every week night for dinner. It is a frequent joke in Acadiana that you’d run home and ask your mother what was for supper and she’d respond “I don’t know, but I’ve got the rice on…”(meaning the rice was cooking in the rice cooker). All Cajun homes have rice cookers. Rice is a common crop in Acadiana and a staple in most Cajun family’s daily meals. Rice and gravy could mean: Bake chicken with rice & gravy, roast beef with rice & gravy, pork chops with rice & gravy….you get the idea. Very much like the scene in Bubba Gump when he’s describing the many ways to prepare shrimp. Friday nights were a special treat – it usually meant a box of Popeye’s spicy fried chicken. I still maintain that it’s the only fried chicken worth eating. If you can find a location that still makes onion rings – GET THEM! They’re delicious. Be prepared to wait though, the onion rings always take forever to cook and you’ll no doubt be waiting for them. What do you remember most from your family’s traditions? Share your stories below.